Culturelle, with Lactobacillus GG, the most studied probiotic (good bacteria) safely and naturally replaces the bad bacteria in your digestive tract leading to improved core health - healthier digestion and a stronger immune system. Significantly more probiotic per capsule than in a serving of yogurt. Safe and appropriate for children. 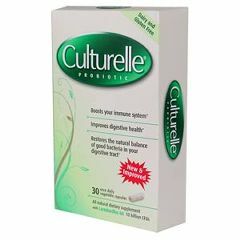 AllegroMedical.com presents The Culturelle Probiotic Dietary Supplement. Culturelle, with Lactobacillus GG, the most studied probiotic (good bacteria) safely and naturally replaces the bad bacteria in your digestive tract leading to improved core health - healthier digestion and a stronger immune system. Significantly more probiotic per capsule than in a serving of yogurt. Safe and appropriate for children.